Global Proving Ground 21 is just days away with a main event that has the masses in an uproar! Matt “Razor Sharp” Rizzo will take on Sean “Shorty Rock” Santella in the main event for the GPG Featherweight title. This contest is so highly anticipated due to both fighters being arguably the best featherweight fighters outside of the UFC in this region. 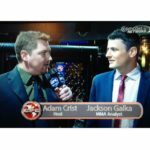 Either fighter could have padded their record to get the call to the UFC, but these two wanted to see who’s best and will figure it out this Saturday at the Event Center in Pennsauken, NJ. “Razor Sharp” was kind enough to have a chat with MyMMANews to discuss and detail everything going into this title contest. “Razor Sharp” gives his take on his opponent calling him a “One trick pony”, as well as Santella’s claiming Rizzo “doesn’t like to be hit”. “Tune in as Matt “Razor Sharp” Rizzo details it all going into this GPG 21 title bout!